Spend a lot of time with your demo site: click through all pages and links; test forms and apps; and walk through tasks for a variety of audiences. Be prepared to make changes—big and small—prior to launch, as well as post-launch. Involve end-users along the way and collect meaningful feedback more than once. As an optimist, I had visualized each portion of this large project going smoothly. The navigation and main sections were firmed up in the initial stages, and then we spent weeks organizing content pieces within the new layout—headings were finalized and content pieces ordered in their proper locations. We did this using multiple outlines in a Microsoft Word document. I think this worked okay for a small, internal site, but would explore alternatives to this method for future projects of this size. Once the layout and content organization was approved, we received a major deliverable for this project: a demo site which allowed us to work in a draft state of the site in real time. During this phase, we were pleased to learn that much of the organization was spot-on. We replaced an old and unwieldy navigation bar that, over the years, had turned into a monstrous and daunting set of twelve tabs. The new dropdown navigation was narrowed down to five “top-task” categories and was cleaner and more intuitive. Redesigned homepage shows the five new top-task navigation menu. Do the steps for this task make sense? Could this content fit in multiple locations? Does this content make sense under the new section/heading? Yes, these questions were asked in the development phase, but it is sometimes necessary and helpful to ask them again once the site is built. Arrange to meet with people who are not familiar with your site to get their take on content organization. Allow them to explore the demo site and provide feedback. The good news is that this is exactly the purpose of working in a demo site. Be prepared to be flexible and know that you will be moving content around, as well as adding headings and content, as needed. This process can be unsettling, especially if you’re a good planner. Uprooting content and sections after weeks of planning is not fun. Ultimately, you want users to find content and so the steps in a task need to make sense. This was an opportunity to fine-tune content arrangement, headings, descriptions, etc., and it’s a last chance for the team to make final and hard decisions about placement of items, top tasks, and ensure the site is user-friendly. 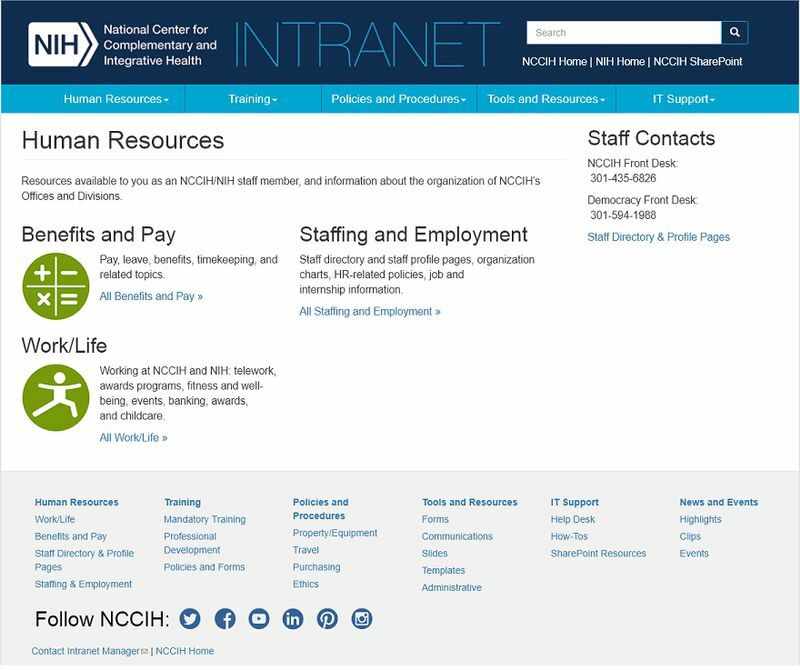 The redesigned Human Resources section. Be prepared to go back to your end-user many times during the project and ask questions and receive honest feedback. Even in the final days leading up to the launch, holes needed filling. We were faced with rethinking an entire section on the site. Although we’d included the content in the planning phase, it just didn’t have the desired visibility or presence on the site. We were able to capitalize on the top-tasks navigation, which allowed the flexibility needed to add the content in the dropdown menu and create a new page. This portion of the redesign reminded me a bit of the experience of moving into a new home – you envision how everything will look in your new place. Then comes the moment after the truck leaves, you walk through the front door for the first time to be greeted by hundreds of scattered boxes and pieces of furniture that somehow now all seem unfamiliar. That’s your new site! For many content managers, keeping content updated and fresh is an ongoing and challenging effort. During the planning stage, and then while using the demo site, our efforts also included removing old or unused content and links. 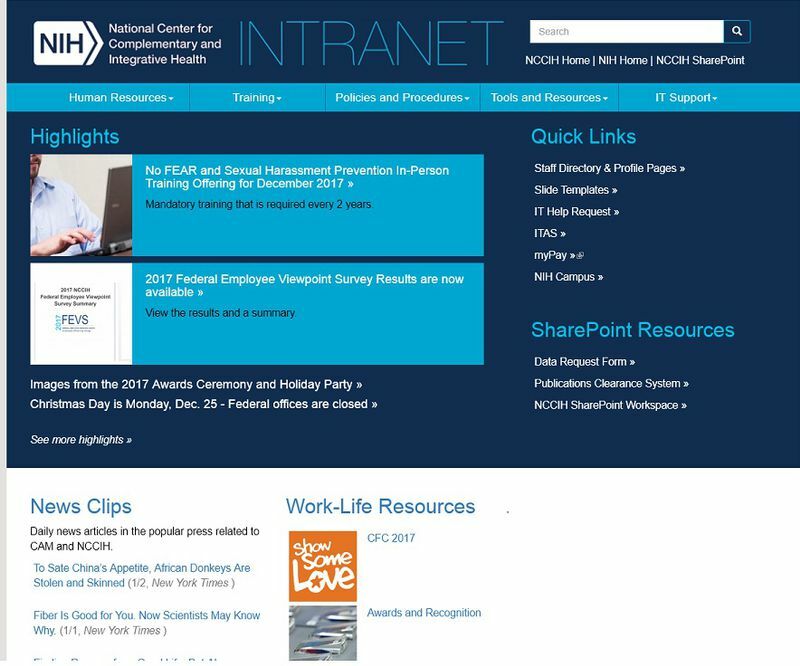 One of my top goals for this redesign was to regain the confidence of users of the site, as well as increase interest in the intranet. This simply cannot be accomplished if your site is littered with broken links, has last year’s holiday party (still) on the calendar, and if there are tutorials for old systems that have long been replaced. Beyond reviewing the content, you will need to employ the help of willing partners at your organization. Content development and updating is not a favorite task for many, but you will find those who are willing to help. As a content manager, I’ve the deepest gratitude for those who took time from their busy days to help improve our staff site. It’s perhaps common sense, but keep in touch with those staff and find time every so often to show your appreciation for their efforts. Design. We used the U.S. Web Design System for many of the design elements. Out-of-the-box, 508-compliant, visually appealing, and user-tested! Top Tasks. Make sure your top-level navigation is on-target and broad enough to capture all top tasks. When unexpected requests and concerns arise later in the process, you should be prepared to solve them within the new framework of your site. Many Different Perspectives. There are many different angles and ways of thinking about content and where it should go. Be prepared to spend time with colleagues in addressing different perspectives and explain why certain decisions were made from the outset. Most importantly, be open to this feedback; it can be hard to hear, but you need to hear it to create the best possible product. Site Comparison. Audit content, compare your new site with the old site, and make clean spreadsheets of everything that must stay or go ahead of time. This way, content can be checked off as you go. Promote. Let the world know there’s a great new resource and why they should care. Emails tend to get overlooked, so, consider creating an interactive ‘hook’ or even carefully-placed paper flyers, which can be effective for announcing an updated internal resource. Karla Blaine is a web content manager at the National Center for Complementary and Integrative Health (NCCIH). Contact her via: email or LinkedIn. For additional information and examples from other federal agencies, check out recent posts in our Content, Design, Managing Digital, User Experience (UX), and User Testing and Research categories. You can also review DigitalGov’s Resources and Checklist of Requirements for Federal Websites and Digital Services, and join our various Communities of Practice (with your .gov or .mil email address).